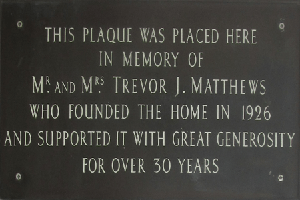 The origins and early history of Brig-y-Don are inextricably connected with the late Mr & Mrs Trevor Matthews who, following medical advice came to settle in Jersey soon after the First World War. Both had suffered from Tuberculosis and met in a Tuberculosis Sanatorium. They married soon after their discharge, though Mrs Matthews remained delicate throughout her life and always had a personal nurse in attendance. 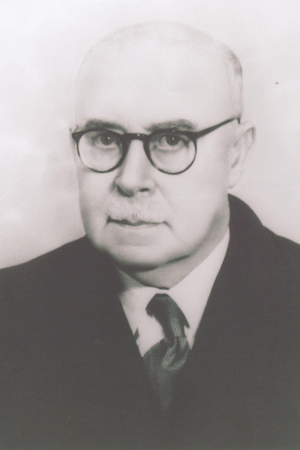 Once in Jersey, Mr Matthews, a financier and shipbuilder from Swansea, quickly established himself in business through the Jersey General Investment Trust, the St Clement's Housing Association and the Belmont Housing Association. He was mainly involved with building much-needed good quality houses for artisans, such as Belmont Gardens, St Luke's Crescent, Devon Gardens and St Clement's Gardens to name but a few; occasionally larger houses were built. It was on the 31st January 1925 that St Clement's Housing Association bought a plot of land and built a home for Mr & Mrs Matthews to occupy. They had come to Jersey because the beneficial climate would help them recover from their illness, However, once completed, Mrs Matthew's health was considered too delicate for the exposed property on the coast. The house named 'Brig-y-Don', which when translated from Welsh means 'Crest of the Wave', was leased by the St Clement's Housing Association to Mr Matthews as from 25th September 1925. Through their physician, Dr Hind, they learnt that Jersey had a major problem coping with an almost endemic state of tuberculosis infection. Particularly worrying was the concern for those children from less fortunate backgrounds, who had nowhere to convalesce following treatment. 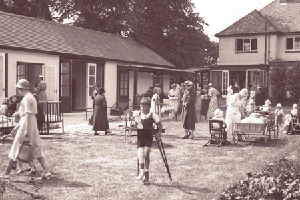 Mr & Mrs Matthews were childless, but loved children, and to them and Dr Hind, the recently completed Brig-y-Don, with its large garden and seafront location, seemed the ideal location for a children's convalescent home. 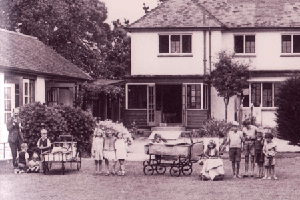 In September 1925, under the direction of a qualified nurse, Miss Violet Mitchell, Brig-y-Don became home to six children in need of 'good food, sunshine and rest'. For the first 6 years the affairs and management of Brig-y-Don were undertaken by a group of people calling themselves the 'Friends of Brig-y-Don'. In essence they were mainly close friends of the Matthews and medical colleagues of Dr Hind. Mr Matthews himself paid the rent and the gardening costs and through the St Clements Housing Association paid for maintenance and repairs. Fees were paid by the parents whenever possible, but no child was ever rejected through lack of funding. The Friends of Brig-y-Don organised fund-raising functions and the proceeds together with donation and subscriptions covered the cost of wages and food. Food costs were kept very low as many of the Friends made regular contributions of meat, eggs and dairy produce. The most famous long-stay patient was Kenneth Fauçon, who was admitted to Brig-y-Don in 1930 aged only two. He lived there all his life, other than a year spent training in England as a radio technician, until his death in 1951 aged just 23. What makes Ken's story so remarkable is that despite being immobilized on a spinal carriage until he was 13, and after that only able to walk with great difficulty using sticks, he was never heard to complain and always tried to help the other patients. In 1937 Ken and his life-long friend Freddie Gallichan, were the first Scouts to enrol in the 18th (Brig-y-Don) Scout Troop, recently formed by 17 year old Peter Manton. Both boys stayed devoted to scouting throughout their time at Brig-y-Don, even during the occupation. 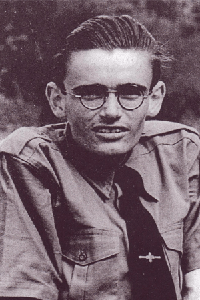 Ken was made a Patrol Leader in 1940 and started a Cub Group based at St Nicholas Church, where he was a Sunday School teacher; this group later become known as the 2nd Greve d'Azette Scout Group. The greatest tribute paid to this young man came in 1949 when Ken was awarded the 'Cornwell Badge', the Scouts equivalent of the Victoria Cross "for his endurance in the face of great suffering and for his heroism in standing up to the treatment which he has been undergoing for a number of years, and also for his continued devotion to the Scout Movement and his work for Scouting despite his physical handicap and great suffering". Following his death in 1951 a wooden hall was erected in his memory to house the 2nd Greve d'Azette Scout Group. This hall was replaced in 1984 with a permanent brick building, still known as the Kenneth Fauçon Memorial Hall today. By 1932 Brig-y-Don had become an established and necessary part of Island life, caring for an average of ten children, with the result that on Tuesday 26th July 1932 at a meeting there, it was decided to form a 'Society' called 'Brig-y-Don Children's Convalescent and Holiday Home' and to obtain from the States of Jersey a Charter of Incorporation for the Society. At this meeting the first honorary officers of the Society were appointed, plus general committee members, medical committee members and patrons. Mr Matthews generously offered to buy the property 'Brig-y-Don' and give it to the Society along with all it's equipment, subject to a small mortgage, payable as and when the Society was able. The rules and regulations were decided upon and were quite up-to-the-minute for that era, though by today's standards archaic – for example, each child to be free from contagious infection and visitors to be admitted only on Tuesdays and Sundays from 2.30 – 4.30pm! In the early days, a devoted group of honorary doctors and dentists worked together for the good of the children residing in the Home. In November of that year a Fund Raising Committee was established, with the power to co-opt members as and when necessary; this management structure was maintained until 1962. In 1938, with help from local Advocates, an Act of Incorporation through the Royal Court of Jersey was granted, enabling the Home to receive bequests of real estate. Over the years Brig-y-Don was very fortunate to be remembered by many people when making their wills. The bequests enabled the Home to set up an endowment fund, the income from which helped finance the Home for many years. In 1934, due to great demand for places, a wooden annexe was added onto the main house. This consisted of one large ward which was used for orthopaedic cases and a nurses cubicle. There were french windows along the side of the building to enable the nurses to wheel the patients out into the garden and sunshine. 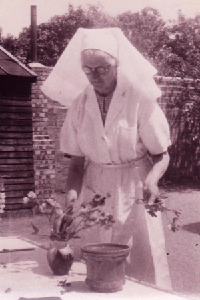 Miss Violet Mitchell was the first matron at Brig-y-Don from 1925 until 1952. Despite there being no effective treatment in those days, other than sunshine, good food and rest, under her direction many children made a full recovery from their illness. Ensuring the Home was run as close to a family home as possible was important to all the staff and many residents have fond memories of this being so. Knitting and sewing were taught, also gardening, which included those confined to spinal carriages, who were given a tomato box in which they could grow small plants and flowers. 'Plasticine' modelling was enjoyed, with entries winning prizes in the Eisteddford. Education was not neglected; those able to walk attended St Clements School, those not were tutored at the Home by retired teachers and clergy. Not all children admitted to Brig-y-Don suffered from TB, many were weak or in need of a holiday or convalescence after an illness. The children were referred by GP's, the hospital, or dispensary (now the maternity hospital). Often the places were paid for by charitable institutions such as the Rotary Club, who for many years sent children from deprived backgrounds for two weeks holiday. On average children stayed for 8 weeks, but there were some TB patients who stayed for many years. On the financial side of affairs, from 1932 until 1948 the income and expenditure of the Home were equal, as Mr Matthews himself made up any shortfall on the balance sheet; this funding was over and above his already heavy commitment to the Home. While it looked as though the committee were never going to be able to pay off the mortgage, a couple of legacies and several large donations meant it was finally paid off in 1939. Just before the occupation, some residents were quickly taken from the Home by their families and taken to England to escape the impending invasion. At first things were very quiet, but soon the numbers were back to the norm of 12 residents. A red cross was painted on the roof in an effort to protect it from enemy fire. During the occupation there was a shortage of food, clothes, medicines and fuel. The Friends of Brig-y-Don all helped as much as possible; milk was collected from Samares Manor, usually barefoot as shoes were scarce, and the morning porridge was cooked in the house next door. Most of the garden was given up to growing vegetables, so the occupying forces often allowed the children to play on the beach. Times were hard, but the staff continued to care for the children to the best of their ability. Even the German troops would sometimes call and leave their chocolate rations for the children and on one occasion even managed to get a wooden calliper from France for one of the children. Following the war, Brig-y-Don had to cope with a different kind of patient. Many youngsters had become under-nourished and had skin problems, due to the lack of soap, heating, decent clothing etc, so Brig-y-Don was kept busy with a full complement of patients needing care. By 1946 most children had recovered from the lack of food, but tuberculosis was back on the increase and Brig-y-Don was the only place that was set up to look after them. The end of an era came in 1952 when the matron, Miss Mitchell, resigned following the death of Kenneth Fauçon in October 1951. For her loyalty to Brig-y-Don and the children since 1925, the Committee awarded her a pension for life. Her sister, Lily, who had served as cook for many years, was also recognised. Miss Mitchell died in 1961. Mr & Mrs Matthews retired from active committee work in 1949; Mrs Matthews continued to support the Home as a Patron until her death in 1956 as did her husband until his death in 1959. Brig-y-Don had indeed lost both its loving parents. This period was a time of peaks and troughs; with the Home having to adapt to the changing economic and social climate. A new matron, Miss Jenkins was appointed in 1952; replaced in 1954 by Miss Playfair, who held the position until 1961. Mrs Hurst took over until 1965, then Mrs Patterson until 1973 when Miss Holley was appointed. With vaccination and curative treatment, TB was almost eradicated, the last TB patient being discharged in 1961. This and the improved general health of the islands population led to a change in the original Deed of Incorporation, so that in 1964 the Home could "admit children under 12 years who for various reasons are deprived temporarily of their normal home life" this was in addition to the categories normally accepted. Once again Brig-y-Don had responded to a social need and the Home was again working to capacity. Finances from 1949 to 1980 were strained; every year there was an annual deficit which was covered by generous donations, subscriptions and income from the endowment fund. Then for three brief years there was a small surplus on the balance sheet, due to the Home running at full capacity, with many children referred by the Education Department. It was necessary to have 12 children placed by and paid for by the department in order to continue to care for children without funding. The "Children (Jersey) Law, 1968" was enacted in that year. This required all child caring agencies to be registered after an inspection. In 1971 a Children's Officer insisted a deputy matron be employed and that fees be increased in line with other similar establishments. Brig-y-Don could still choose not to charge a fee where appropriate. In 1972 Brig-y-Don was in trouble; there were no children in residence for two months, with a staff of nine still employed. Various ideas for the future of the Home were explored, then under the guidance of Mr Maurice Letto, (President 1971-1979), it was decided that the ideals of Mr & Mrs Matthews must be upheld by responding to the prevailing social, rather than medical needs of the island's children. It was decided to found a day nursery to run in conjunction with the residential unit. This was opened on October 9th 1972 and proved an immediate success. 1973 saw a year of major staff changes, with a new matron, deputy matron and two new senior members of staff. Early in 1974, having been impressed by the dedication of recently appointed staff members and confident that Brig-y-Don was pursuing the correct child care policy, the committee launched the Golden Jubilee Appeal. It was hoped to raise £100,000, but the final figure was a magnificent £184,900 which enabled the Committee to achieve all their objectives. 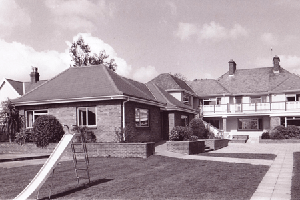 On 5th September 1982, exactly 57 years after the Home opened its doors, HRH the Duchess of Gloucester accompanied by her husband HRH the Duke of Gloucester, performed the official opening ceremony for the purpose-built playgroup wing, which replaced the old annexe. In addition, the kitchen and laundry rooms were rebuilt, the buildings fire precautions brought completely up to date and a property across the road from Brig-y-Don was purchased and converted it to staff accommodation. The playgroup continued to be a huge success, with a waiting list for places. It became a welcome meeting point between the residents at the Home and those attending the playgroup, whose friendships eased the transition into primary school. The nursing uniforms worn for many years had been dispensed with by Miss Holley following her appointment, as acute nursing care was no longer needed. It was felt that uniforms were contrary to the present aim of offering children from deprived or disturbed backgrounds a secure, personal and caring refuge in which they felt at home. In 1984 Brig-y-Don offered child care on a broad front. During these years the resident children were taken off-island on summer camping holidays to other Channel Islands, England and France. These trips were greatly enjoyed and were a focal point of the year. Staff would organise various fund raising activities specifically to raise extra funds for the children to enjoy special treats on these holidays. Brig-y-don continued to care for children who, for a variety of reasons, were unable to be with their own families. The dedicated staff team, led by Miss Holley, strived to provide a warm, homely and caring environment in which the children could thrive. Day to day life was necessarily orderly, with school, homework and 'jobs' to be done, but there was a huge amount of fun and laughter to be enjoyed too. The large walled garden and the Home's proximity to the beach, meant lots of time could be enjoyed outside, with picnics on the beach a firm favourite. Summer barbeques, holidays, birthday parties, Christmas concerts and visits to the pantomime, were all enjoyed by the children. Much time was spent preparing children for the future. Where possible this would be to go back to their own family, but if not, then preparations for fostering or adoption were made. When a suitable family was found, both child and family were supported by the staff team to make the transition as stress-free as possible; introductions were made slowly and relationships allowed to build naturally. Brig-y-Don provided outreach support for as long as needed by the child and new family; this could be over months or even years. Brig-y-Don pioneered outreach work in the island, which became a much needed and welcomed service offered by the Home. The matron and staff put their heart and sole into improving the lives fo the children in their care. Some children stayed at Brig-y-Don throughout their childhoods as there were never enough suitable foster placements. Over the years, the staff and management recognised the ever-changing requirements in child care and welcomed the introduction of new legislation and training opportunities which led to improvements in child-care practice. Staff members embraced new ideas and were open to change. Inevitably these changes and improvements had a significant effect on the cost of staffing the Home. Funds became increasingly difficult to secure and due to State cut-backs, the annual grant was not increased to keep up with the rise in expenditure. Miss Holley retired in January 2005, after serving 31 years as Head of Home. She was awarded an MBE for services to Disadvantaged Children in Jersey and still continues to be caring and supportive to some of the young people that spent much of their lives at Brig-y-Don. Mrs Caroline Ludlow was appointed as the new Manager and continued in the post until her retirement in 2009. Mrs Ludlow's background in nursing and in management roles within the Children's Service had equipped her to introduce Brig-y-Don to the world of Information Technology! Whilst recognising the need to update management procedures within the Home, she also recognised the importance of retaining a level of 'hands-on' care and an in-depth knowledge of all aspects of life within the Home. Legal requirements necessitated that record keeping systems were updated, formal policy and procedural guidelines covering all aspects of life within the Home were introduced and the accounting system of hand written ledgers was moved to Excel spreadsheets. A fine balancing act was required throughout this period of management. Inevitably nothing could prevent the on-going financial problems and Mrs Ludlow retired in August 2009 coinciding with the closure of the Home. The next few months were spent carefully and sadly archiving... to mark the end of an era. With costs rising sharply and donations falling, after an 8 year struggle, Brig-y-Don Children's Home was forced to close on 31st August 2009. In the lead up to this date, with support from the staff, the remaining residents were transferred to other residential units or placed with foster families. The closure caused enormous disruption to the children in their already confused lives. Two siblings had to be sent to a special unit in the UK as there was no other suitable unit locally; this came at a huge cost to the tax payer. Some staff members were offered jobs by Health and Social Services others chose to take a redundancy package. A huge blow to the finances of the Charity came, when a pension liability associated with Brig-y-Don's membership of the Public Employee Contributory Retirement Scheme (PECRS) crystallised on the closure of the Home. This debt crippled the finances of the charity, requiring it to take out a loan, which took several years and the generosity of loyal benefactors to repay. During this time the charity was in no position to help those it was intended to support. This was not a situation the Charity was prepared to maintain. The Committee, under the Chairmanship of Susie Pinel, continued to negotiate with Health & Social Services, to secure the best future for vulnerable children of Jersey needing residential care. This culminated in an agreement being signed in April 2010 for the States of Jersey to lease the building from the Charity for a market rental, as opposed to the 'peppercorn' rent offered by Health and Social Services. This is now the main income for the charity. As part of the agreement, the Home was extensively refurbished during 2011 by the States, to bring it in line with current guidelines and standards as recommended by Andrew Williamson in his 2008 report on all residential homes in the UK. A garden party was held for staff, past residents and officials to celebrate the re-opening of the Home; this was held on 4th June 2011 and the then Lieutenant-Governor, General Sir Andrew Ridgway, unveiled a new plaque to commemorate the reopening of the Home, which is now being run by Health & Social Services as a residential unit known as Brig-y-Don House. The administration of the Charity moved from the St Clement building to the Home of the Charity's secretary, ending 85 years of the charity operating from the same property. In 2012, as the charity slowly started to recover financially, it was possible to start making a few disbursements to help individuals and families in need of support. However, much work was still required to ensure compliance with modern day regulations and to raise the money needed to fund future projects. The property Sable d'Or, owned by the charity and previously used as staff accommodation, was leased on the open market to create another source of income. 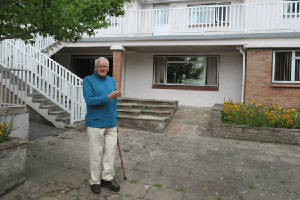 Initially the rent had to be put straight back into the property, which needed a new roof, windows and much maintenance, having been neglected for years due to lack of funds. To ensure measures of 'best practice' a revised Business Plan was compiled and the financial 'Statement of Regulatory Practice' (SORP) introduced. These measures were taken to ensure compliance with the anticipated introduction of a Charities Law in the near future. Also the Secretary studied for the Certificate in Offshore Finance, to equip her with the necessary skills to carry out her job effectively. The Committee was reformed as the 'Management Board', whose first objective was to determine the areas of greatest need for children in Jersey. The board included two previous managers, Margaret Holley and Caroline Ludlow, as they had the experience to ensure continuity of support for children in care and leaving care. A huge amount of research was carried out and discussions were held with various Health and Social Services departments, proving that while support was still needed for children in care, the greatest need was for youngsters leaving care. It also became apparent that the level of poverty in Jersey was much higher than previously realised and many families were struggling to manage. 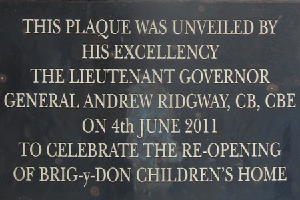 Once the need had been determined, the charity wrote a new constitution to reflect the restructured service that it would provide in the future; the decision to alter its name to 'Brig-y-Don Children's Charity' was also made, which was more in keeping with its new role. On the 16th May 2013, the new constitution was signed by the Chairman, Deputy Susie Pinel, during a special visit to the Home and witnessed by the Charity's Patrons, Lieutenant Governor of Jersey General Sir John McColl KCB, CBE, DSO and the Bailiff of Jersey, Sir Michael Birt, QC. From now on the aim of Brig-y-Don Children's Charity is to provide support to children, young people and their families by providing financial assistance not available to them from the States of Jersey. Principally funds are used to buy goods, services and life-enhancing experiences that will improve the lives of children and young people in residential care in Jersey. It will then continue to provide these when, as young adults, the children leave care to live independently in the wider community. As a secondary purpose the Charity will also consider any request to help a child in need in Jersey. As awareness of the Charity's new purpose spread, 2014 saw a steady increase in applications. The charity is most grateful to the members of the Leaving Care Team who were instrumental in helping with this; initially, most disbursements were made through this team. As with any new venture, there were problems, the main one being that the general public were not aware the charity still existed. In May 2015, the 70th anniversary of the Liberation of the Channel Islands, one of the former residents, Freddie Gallichan made a trip to Jersey to join in the celebrations. After he had been diagnosed with TB in the hip, Brig-y-Don became his home during the occupation and for a number of years afterwards. Freddie still has very fond memories of Brig-y-Don and can be seen pointing to his bedroom window in this picture. In 2015 the Board decided to develop a website, have a presence on social media and recruit a fund raising officer, who would also be responsible for marketing the charity. Wendy Nerac took up this new post in June and in a very short space of time was organising fund raising events and promoting the cause. By networking with many friends and colleagues, especially on social media, Wendy has begun to spread the word that Brig-y-Don Children's Charity is still very much here to help. No history of Brig-y-Don would be complete without reference to those people who over the years gave their time and energy with such dedication in an honorary capacity. There are too many to mention individually, suffice to say, without their services Brig-y-Don would not have survived to help the children who needed its service. Brig-y-Don is proud to have been honoured by the Patronage of every Lieutenant Governor since the appointment of His Excellency Sir Edward Grassett in 1945 and every Bailiff since Lord Coutanche in 1935.